Presenting Acorn Squash at a Cocktail Party! When I have a large guest list, I would choose to host a cocktail party. It is understood that a full meal won’t be served, instead there will be a number of hors d’oeuvres and drinks. The focus of this type of party is the company. People usually mingle and catch up with others they haven’t seen for a while. In terms of food, cocktail parties are all about presentation! 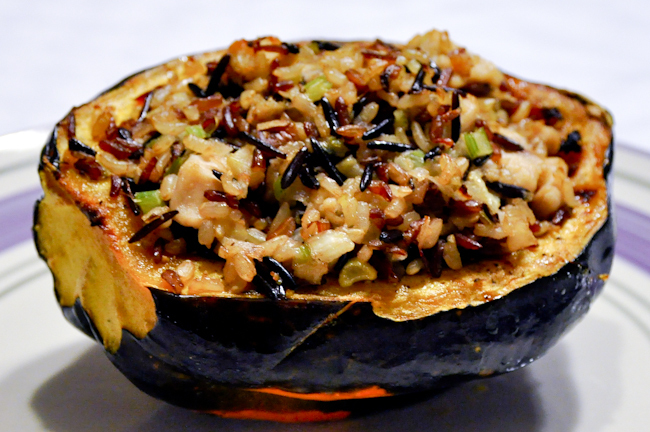 That’s why I highly recommend this roasted acorn squash with chicken and wild rice stuffing as one of your dishes. Not only will the half acorn squash make the presentation interesting, the stuffing will wow everyone! To make this vegetarian, just omit the chicken. To serve this as part of the buffet table at a cocktail party, get the biggest acorn squash you can find.